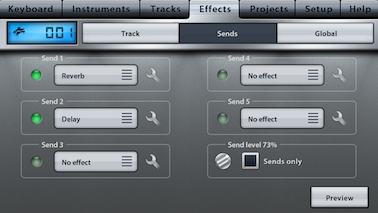 Both the Effects tab and the Tracks tab’s FX panel show all track, send and global effects. The Effects tab has a track selector in the upper left corner. Swipe it horizontally to change the track. 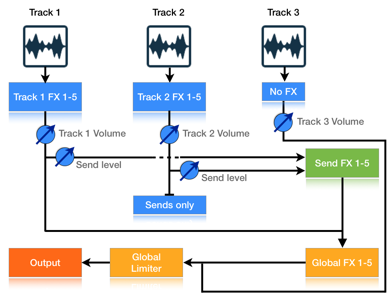 Track and Send FX always refer to the selected track. In addition to Music Studio's effects, all installed Inter-App Audio effect apps are listed in the effect selection menus. Read the chapter about Inter-App Audio for more information. Also called insert effects, track effects apply only to one track. There are 5 such effect slots per track. The 5 send effect slots are on 1 send bus that is common for all tracks of a project. The send level can be set for each track separately, but the level is for all send effects on the send bus (there are no separate send levels for each of the 5 slots). Example: The send bus contains a reverb. A track’s send level is set to 50% which means that in addition to the normal track output, 50% will be routed through the reverb. Note that this also makes the track louder (100% dry + 50% reverberated). At the end of the signal chain, the 5 global effects and the global limiter are applied. Track effects are applied first, unless the No-FX button is enabled (track 3 in this example). The track’s volume is multiplied. The result is routed to the global effects, unless the Sends only button is enabled (track 2 in this example). Additionally, the result is also multiplied with the track’s send level and routed to the send effects. The send bus mix is routed to the global effects. The last global effect is the fixed global limiter which prevents clipping. 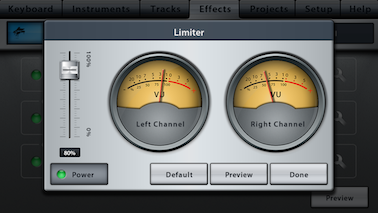 No-FX tracks are routed directly to the global limiter, bypassing all send and global effects. Save CPU processing power by only using 1 reverb as a send effect that is shared by all tracks. A disabled effect doesn’t require any processing power. 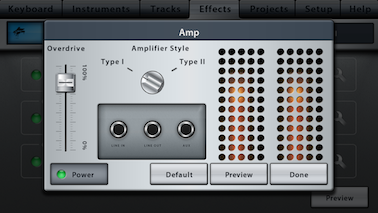 Use the global effects for mastering, for example with the equalizer, compressor, or StereoWidener. 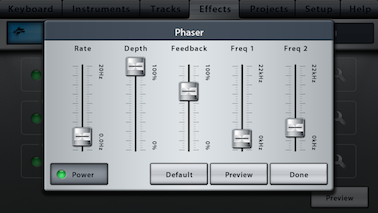 Delay, compressor, filter, phaser and BitCrusher are useful to change the sound of a specific track. The order of the effects has an influence of the resulting sound. Some effects (e.g. equalizer) are not useful as send effects for most songs, because the dry signal (without send effects applied) is routed to the global effects anyway. Think of the send effects as a parallel signal chain which adds to the mix. Adding an equalized signal to the non-equalized dry signal doesn’t make much sense in most cases, whereas adding a reverberated signal to the dry signal is useful because reverb is a time dependent effect. The power button enables or disables the effect. Disabled effects require no processing power. “Limit to FX tracks” puts the effect into the FX bus, meaning that it will be applied only to those tracks which have FX enabled (blue FX icon in the track list). All the other effects are still applied to all tracks after the FX effects are processed. The default button resets the effect's settings to the preset values. Tap the preview button multiple times to hear different notes played with the current instrument. Reverb simulates a room of a certain type (hall / canyon / room) and size. Reverb is best used as a send effect. Each track has its own send level, which in this case would set the amount of reverb for the track. Reverb is the most CPU intensive effect. Having only 1 reverb send effect that is shared by all the tracks saves processing power compared to using multiple reverbs as track effects. If reverb is assigned as a send effect, its mix is automatically set to 100% wet because the dry signal is routed to the global effects anyway. Style: Each reverb style uses a different algorithm, thus the size fader has a different effect for each style. Quality: In technical terms, as you lower the quality, the reverb algorithm stays the same but the number of filters used in the reverberation filter chain decreases. 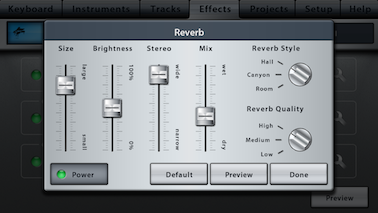 Tip: Reverb requires a lot of processing power. If audio stuttering occurs during playback, decrease the reverb quality. Size: Controls the size of the sound space. In larger spaces, the reverb is audible for a longer period of time. The total size also depends on the selected style, e.g. the largest room reverb is smaller than the largest canyon reverb. Brightness: Lower brightness gives the impression of a darker room (using a low pass filter), while maximum brightness leaves all the high frequencies in the reverb. Stereo: Stereo spread results in the perception of stereo wideness of the reverb space. In technical terms, this fader sets the delay between the reverb reaching the left and the right channel. Mix: The mix fader controls the proportionality of the dry sound (the original sound without the effect applied) and the wet sound (the effect's result). The delay effect repeats the original sound in a certain time interval set by the timing buttons/switch and the song tempo. The result is then fed back into the delay, resulting in many repetitions. 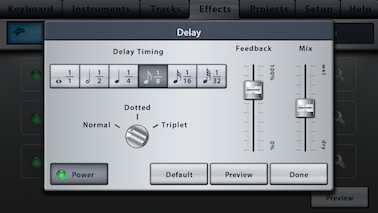 Delay timing: The selected note length will define the time interval of the delay, together with the song tempo. Dotted timing is 50% longer, triplet timing is 33% shorter. Feedback: Low feedback limits the effect to just one audible repetition, high values increase the total delay duration. Delay mix:The mix fader controls the relation of the dry sound (the original, without the effect applied) and the wet sound (the effect's result). 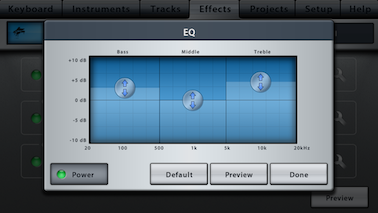 The 3-band equalizer has fixed frequencies at 800Hz and 5kHz. Tap or move anywhere in the 3 areas to set the gain of bass, middle and treble tones. The range is -10dB to +10dB, the volume is automatically adapted to avoid clipping. The filter effect is a resonant low-, high-, or band-pass filter. The cutoff frequency and the resonance can be set by moving the crosshair, or by tilting the device if the accelerometer is enabled. The filter track in the track list holds the recorded events, which can be edited in the bar editor. The crosshair indicates the current values of the cutoff frequency (x axis) and the resonance (y axis). Move the crosshair to change the values. This can also be performed during recording. Beware: high resonance values may lead to unpleasantly loud and high tones. If snap back is enabled and the crosshair is moved, it snaps back to its original location when you lift your finger from the screen. 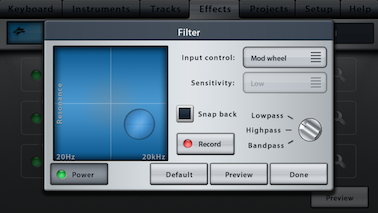 The filter type defines how the cutoff frequency influences the sound. Lowpass: All frequencies above the selected cutoff frequency are dampened (attenuated). The sound remains unchanged if the crosshair is in the lower right corner. Highpass: The effect behaves inverse to the lowpass. All frequencies below the selected cutoff frequency are dampened. The sound remains unchanged if the crosshair is in the lower left corner. Bandpass: Frequencies above and below the selected cutoff frequency are dampened. The sound remains unchanged if the crosshair is at the bottom center. If the accelerometer is enabled, tilting it in any direction changes the cutoff and the resonance. The axis can be set to X, Y or X+Y. For X or Y axis, both the frequency and the resonance change if the device is tilted in the selected axis. In X+Y mode, tilting along the x axis changes the cutoff frequency, while the y axis changes the resonance. Starting from the centered position, all 4 quadrants are symmetrical, i.e. tilting the device to the far left has the same effect as the far right. With the sensitivity set to low, the device needs to be tilted almost 90 degrees to achieve the maximum effect. At high sensitivity, small movements are sufficient to set the filter values to their maximum. Rate: The speed of the sweep, i.e. of the LFO. Depth: The amount of wet (effected) signal output. Feedback: The intensity of the effect, i.e. the height of the peaks. Frequency 1 & 2: The frequency range in which the peak moves. Overdrive: The overdrive fader controls the amount of distortion, i.e. the input gain for the amplifier. Style: The amplifier style defines the mathematical function, resulting in a different timbre. 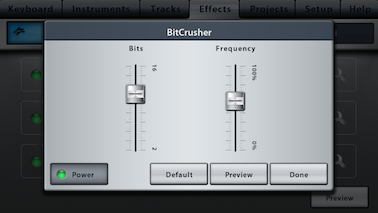 The BitCrusher effect produces a lo-fi distortion (i.e. a quantization noise) by reducing the resolution of the audio data. It intentionally emulates early digital audio gear or the sound of vintage video games. Bits: Audio data is reduced from 32 bit (232 possible values) to 2-16 bit (value range of 2^2 to 2^16, respectively). Frequency: Controls the sample rate reduction which degrades the audio quality. High frequencies are lost at lower frequencies. The compressor effect reduces the dynamic range by quieting loud signals. The resulting signal’s amplitude is compressed to a smaller value range. The result can be optionally amplified (with the output fader) to increase the perceived overall loudness. Threshold: The compression kicks in if the signal’s amplitude exceeds the threshold. Ratio: sets the amount of gain reduction. A ratio of 4:1 means that if the input level is 4dB over the threshold, the output signal level will be 1dB over the threshold. Attack: sets how quickly the compressor acts, i.e. how fast it starts decreasing the volume when the threshold is reached. Release: sets how quickly the compressor stops reducing the volume when the input signal falls below the threshold. Output: Because the compressor is reducing the level of the signal, it is practical to amplify it again with the output fader. High values might result in clipping (crackling noise). Clipping occurs if after adding up all the track’s and effect’s signals results in an absolute value greater than 1.0. The limiter prevents clipping by applying a smooth mathematical function to keep all numbers in the -1.0 to +1.0 range. The limiter’s fader controls the slope of this function. High values may lead to unwanted distortion artifacts, low values may not produce the desired volume. Set the master gain fader so that the decibel meters barely hit the red areas for the loudest part of your song. 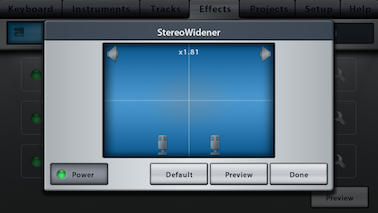 The stereo image of the mix can be enhanced or narrowed with the StereoWidener effect. Move the two microphone icons farther apart to increase the separation between left and right panned signals. Be careful not to overdo the effect. Move the two microphone icons closer together to narrow the field or even create mono output (= the same signal on the left and the right channel). A factor of 1.0 means no change.